Robert Sullivan is is a poet and academic. 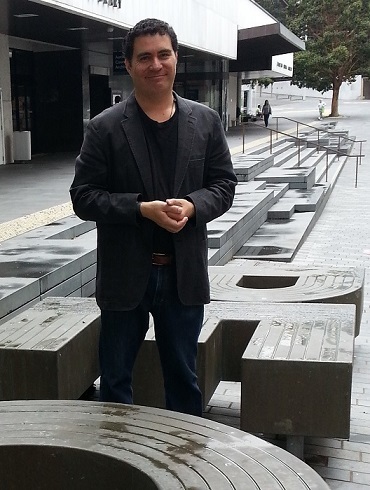 He is a significant internationally published Māori poet, author of seven collections of poetry and editor of a number of anthologies. released. He works at the Manukau Institute of Technology. Read more about Robert’s work here. 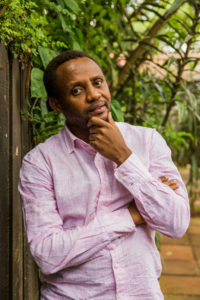 Billy Kahora is a writer from Kenya. His short fiction and creative non-fiction has appeared in Chimurenga, McSweeney’s, Granta Online, Internazionale and Vanity Fair, and Kwani. His work includes the non-fiction The True Story Of David Munyakei. He was highly commended by the 2007 Caine Prize judges for his story ‘Treadmill Love’; his story ‘Urban Zoning’ was shortlisted for the 2012 prize, as was ‘The Gorilla’s Apprentice’ in 2014. 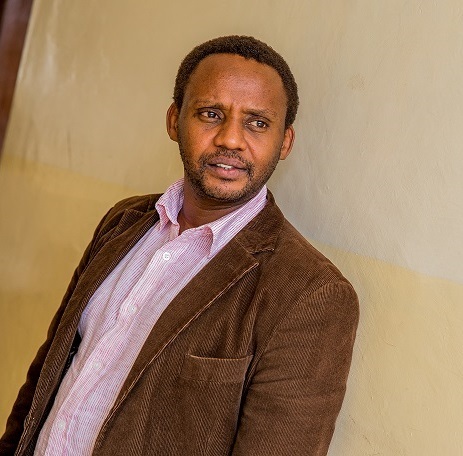 He wrote the screenplay for Soul Boy and co-wrote Nairobi Half Life, Kenya’s first Oscar submission, which won five Kalasha Film and Television Awards. He is working on a novel, The Applications, and a short story collection, The Cape Cod Bicycle War and Other Youthful Follies, will be released in 2017. Billy is Managing Editor of Kwani Trust and has edited seven issues of the Kwani journal and other publications including Nairobi 24 and Kenya Burning. He is also a Contributing Editor for the Chimurenga Chronic. 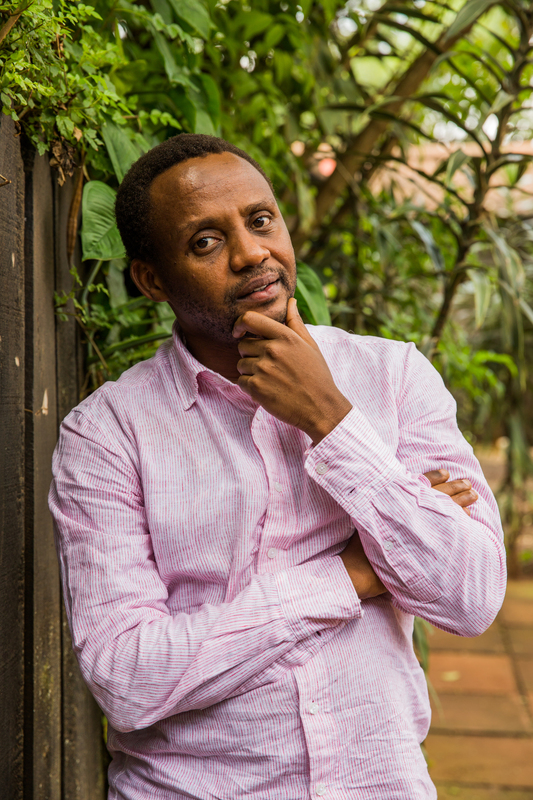 He has been Kwani Litfest Curator since 2008 and recently curated Kwani Litfest 2015 Writers In Conversation: Beyond The Map Of English. Billy is a past recipient of the Chevening Scholarship and an Iowa International Writers Program Fellowship. This exchange took place over email in April and May 2017. Hi Robert, pleased to meet you. In Gikuyu I would greet you thus: Wee mwega. In Kiswahili: Habari gani. I write fiction and non-fiction (variously described in other places as literary or creative non-fiction or even narrative journalism). I live in Nairobi now but I have spent significant periods of my life in South Africa, Scotland and the U.S. I see that you wear many additional literary hats that are in ways similar to the ones I wear as Editor and part-time writing teacher. For now, I will just say I am no poet and come back and tell you what I am up to one-on-one with you a bit later. Kia ora, Billy. It’s a pleasure to be in touch with you. I’m a poet and a teacher of creative writing, formerly a librarian. These days I find myself writing love poetry, although not so long ago I was more interested in historical narratives in verse, re-telling histories in a creative format that removed them from the pantomimes of history and into unusual rhythms and spaces. I was hoping to conscientise our literature, to make it possible to embrace words like colonial, or even imperial in our contemporary literature, rather than allowing us to remain is-lands. It’s about decolonising minds here by recognising colonial pasts. My mother’s people are the largest tribe, Ngāpuhi, from Northland, about three hundred miles north of Auckland where I live; my father is from Wellington. His father was an Irishman, and his mother was from the South Island tribe, Ngāi Tahu through her mother (my great-grandmother), and through her father (my great-grandfather) she had Welsh ancestry. The effects of colonisation on Māori have been deep, resulting in our being in most of the negative trends demographically. We’re about 15% of New Zealand’s population, currently. Nevertheless, our culture is strong. I’ve never visited the African continent, and I cannot claim to be familiar with Kenyan literature. One of the most influential thinkers in postcolonial studies here, Ngugi wa Thiong’o, visited Auckland about twenty years ago. I was lucky enough to get his signature at a reading, though, in Honolulu, Hawai’i, where I lived for almost ten years (that was about 2008, I think). A Māori intellectual and academic, Linda Smith, wrote an excellent summation of Western ideologies and their influences on indigeneous ways of knowing, Decolonising Methodologies. Both Smith’s and Ngugi’s work helped me to navigate and to replace some rather dense Eurocentric theory as I wrote my PhD on indigenising a close reading method for five indigenous writers of the Pacific region. I am the Managing Editor of an outfit called Kwani Trust. Kwani started off as a literary network of a generation of writers. Over time it has developed into a small publishing firm that also curates a biennial literary festival, runs a poetry performance space every first Tuesday of the month and produces a literary journal Kwani every 18 months or so. I edit the journal and co-curate the festival. My time is split between writing and my day job. I’ve been working on a novel for about three years. I started the novel a while back in 2006/7 while I was doing an MSc in writing and then I put it away for different reasons. I was going through a different phase in my writing which lasted at least four years when I was reading and writing mostly non-fiction. I went back to the novel in 2012 and been working on it steadily since then. Early in my career when I came to back to Kenya in 2005 I mostly wrote short stories. Just recently I decided to put these in a collection – working title is The Cape Cod Bicycle War and Other Youthful Follies. All the stories are in one way or the other about youthful failure. I hope this will be out next year. So, my writing in phases continued and after the short story stint I started writing creative non-fiction from 2008. I wrote a book back in 2010 titled The True Story of David Munyakei about a Kenyan whistle-blower who went into hiding for a decade when he worked as a Central Bank clerk exposing import irregularities. 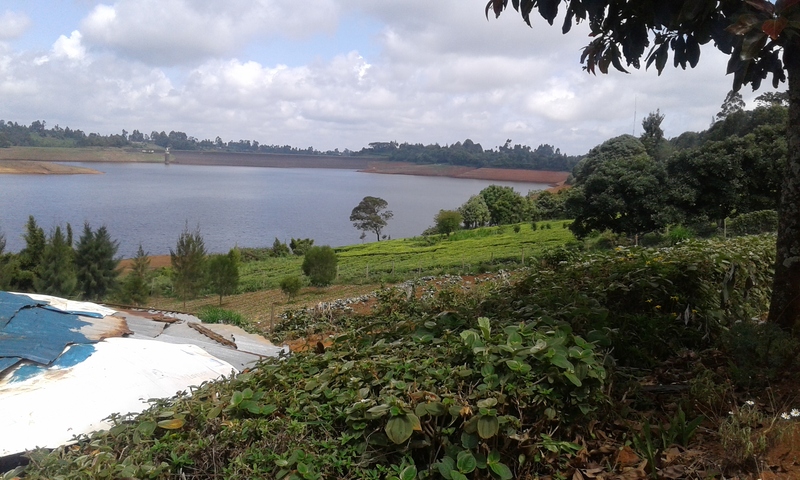 The scam involved the highest echelons of government at the time that resulted in serious inflation and the disappearance of about a million dollars from Kenya Treasury coffers. After the book I worked on several extended creative non-fiction projects at the time including an extensive investigative stint in environmental corruption. I then ended up at the International Writers Program in Iowa and did a five-city tour of the US. Non-Fiction Writing from the tour was published in an anthology titled Fall and Rise, American Style. After this non-fiction stint I wrote three films. Two of these – Soul Boy and Nairobi Half Life, which I co-wrote with three other writers – were produced locally but also got onto the European film circuit and did pretty well. The other is still in film production limbo. Then I got back to my novel and that’s what I’ve mostly been working on with a short break on the collection earlier this year. I’ve edited five Kwani journals, a Sci-Fi anthology with a Malawian publisher and two visual collaborations between writers and photographers titled Nairobi 24 and Kenya Burning. In all these projects, in my work as a writer and editor I’ve always set out to capture the social realities around me on the page. This comes from when I was growing up and realising that there were such few examples of writing of the life around me. Recognised works by Kenyan writers such as Ngugi capture an older Kenya. So, I would say that my writing project has been trying to recapture my social realities through creative non-fiction (experience) and fiction (experience and the imagination). I also like to test the veracity of my observable realities. The fiction I’ve always liked is always described as hyper-realism which I think challenges the limits of descriptive realism. I was born in Nairobi. My parents are Gikuyu, one of Kenya’s largest tribes. I grew up with a lot of Gikuyu-ness at home but Gikuyu-ness was also something I saw as past, my parents’ past. I can speak Gikuyu passingly well but cannot write it. I can speak Kiswahili better but cannot write it as well as I do English. My third language is Sheng, an urban patois that mixes English, Swahili and Kenyan African languages. My imagination straddles these language worlds and even if I write in English it is one that is peppered by the influences of the other languages I’ve mentioned. I grew up in a generation that was well aware of past colonial influence but more affected by ongoing national politics. I have always felt in-between the traditional and the post-traditional, what many might describe as modern, always in a strange and unique time/space between modern urban Kenya (partly Western/English/educated tinged by so many other African cultural forms). This transition is multi-dimensional, non-linear and chaotic in a good way, at least as a writer. I like to think in hours I can move within a physical distance that spans decades. We hosted Ngugi wa Thiong’o at our 2010 Kwani Litfest. I distinctly remember a conversation I had him with him on FM talk radio about writing in one’s own language. In the conversation he meant African languages as our own languages. As I listened to him I wondered what I was to do because I had grown up in a society in which three to four languages were used in equal measure and in different spaces. My generation in a certain Nairobi space grew up caught in between these three to four language-worlds. So, I wondered during that conversation, what is my own language? The Gikuyu of my parents? A language of familial intimacy? The Kiswahili of the nation? A language of national authority when I was growing up? Sheng? A language described frequently as an urban patois of rebellion – for me of freedom between the nation, parental authority and English; a language of official knowledge, instruction, of privilege. My imagination exists in all these language-worlds. I choose to write in English because that’s the language I first wrote in when I started school. I was never given anything else. With time it is an English I feel that I can bend into all the worlds I’ve described. An English that captures Gikuyu-intimacy, Sheng-rebellion, Swahili-nation authority. An English of my own. I think that Ngugi’s arguments for writing exclusively in African languages leaves little room for individual agency and choice. From my perception in his arguments, language is an all-powerful structure that either privileges or conquers whoever uses it. Linda Smith’s book sounds very interesting. The most influential work of theory on my own work and thinking is On the Post-Colony by Achille Mbembe. I’ve just read your story ‘The Gorilla’s Apprentice’ on a blogsite. I’d tried to read the Granta site where it first appeared but I haven’t a subscription so had to switch to the blog. It’s a great piece. What drove you to write it? Is it the surface story of Jimmy and his friend Sebastian the gorilla from Rwanda? or the comprador gorilla expert, Professor Semambo. Are you a character-driven writer? For a short story you conveyed a lot of character. Did this story bubble up for you? How did it present itself? The orphanage for animals resonates with the boy’s back-story, and his yearning to speak the gorilla’s language through the parental figure of the professor while fires burn outside, a newspaper article and a ‘muted’ television news item all revealing political violence. Was it anything to do with the political unrest of the time? Are you like a poet who doesn’t wish to explain one’s work? It’s tempting to ask about the embrace at the end of the story and what it represents. For me, I see an uncomfortable alignment between Sebastian and Semambo, a deeply colonial embrace. I found your usage of the word ‘apoplectic’ quite troubling, quite spot-on in that moment of recognition and the indignation of the master as he is killed by the creature just as it is euthanized by his injection. I guess I’m answering this one for you. If you don’t wish to explain the piece, could you talk about the process, and the communities, of its creation? I wrote ‘The Gorilla’s Apprentice’ after the post-elections violence of 2007-2008. After the Kenyan elections in December 2007 half the country started burning after the Presidential vote was split in half and contested. At the time I put together a writing workshop asking writers for stories based on their experiences of the time. Several things jumped at me from this political crisis that would inspire the story. One was the Nairobi-based foreign media’s attempt to look at the crisis as purely ethnic at the time and suggest the potential for a genocide a la Rwanda. This approach was simplistic but telling. The Rwanda genocide in 1994 has always been a large part of the social imaginary in Kenya. This is partly because of the country’s proximity, with a lot of Rwandese citizens living in Nairobi since the 60s after several ongoing crises there over time. So, when the crisis happened in Kenya the genocide was a very familiar reference. And there was a large outcry that Kenya was not Rwanda. The idea of a genocide remained with me for a long time and would influence the story. The second aspect of the crisis was a worrying refusal to engage in what had happened by the urban middle-class. The majority of the conflict, killings, looting happened in the urban slums and specific rural areas and so the urban middle-class did not see it as their problem. I became aware of this aspect of the crisis and it was to inform the context in which the story worked and looking into how middle-class-ness played into an event of national significance. The other thing that influenced the story was an alarming rumour that never really goes away even now that one of the most sought after international Génocidaires, Felicien Kabuga, lives or lived in Kenya protected by politically well-connected individuals. This brought the story arc together. These I would see as the thematic elements. As a kid I remember visits to the Nairobi Orphanage. There was a celebrity gorilla there called Sebastian, brought from Rwanda, that all Nairobi kids (at least the ones I knew in school and in my neighbourhood) knew. So, I thought it might be interesting to bring in this celebrity gorilla character with an international fugitive and former Génocidaire within the context of a political crisis. Then, Jimmy the boy-character, whose life with his mother was slipping down the class ladder. A bit more on the middle-class context. I feel that the Kenyan class context involves an uneasy mix of aspiration and disappointment based on Kenyan social realities over the last three decades. 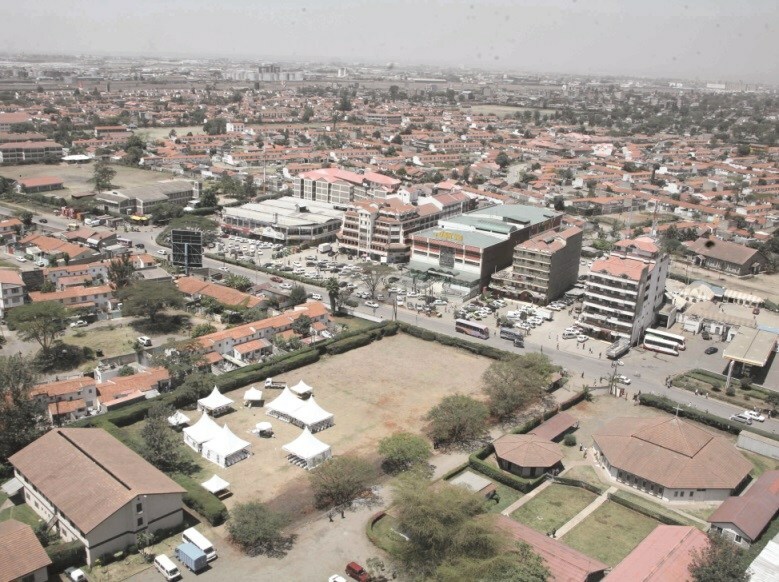 Kenyan urban life seems to be a constant treadmill of social and economic aspiration, a never-ending hustle chasing money (rent) and power (illusion of self-control) that compromises values all to keep one’s precarious class position at the expense of physical and mental health. I wanted the story to play out in this context. A world that is constantly precarious that suddenly starts burning. And there I had a series of images. Then, back to the image of the Orphanage and the gorilla, Sebastian, who Jimmy constantly visits to remember older and happier middle-class times. And then again, the third – the Génocidaire. The closing brings them together as the crisis reaches its zenith. The story is partly set in Kibera, a slum where the blood-letting happens juxtaposed against middle-class settings just minutes away. With most stories I think I am an idea-driven writer. I start with a ‘what if’ scenario? And then think of a character that fits in the scenario. The character that humanizes the idea. With some stories the two – the character and the idea – come together almost at the same time and it’s hard to differentiate. These are the easier-to-write stories. I finished a short story collection last May. I started most of the stories from ‘what-if’ scenarios partly from experience then building them through the fictive. I’ve been accused by a writer friend of mine of trying to rewrite novel ideas into short stories. Like many stories in the collection I’ve been told ‘The Gorilla’s Apprentice’ reads almost like a truncated novella. I’m not sure whether that is a good or bad thing. I wrote it very quickly in the heat of the crisis. Maybe if I’d put it aside and revisited it I might have expanded it into something more. So, like you point out, it has a lot of characters. I am not too sure whether it really works or now. The novel I am working on is based on a middle-aged female character who deserts her middle-class family to go into a neighbouring slum to become a sect leader. Told in fivve sections it tells the story of the middle-aged woman, then the narrative shifts to her husband and her three kids. So, different voices, different registers. I plan to finish in 2017. I also want the novel to be about this class transition conundrum that I mentioned. I want it to play with language-worlds moving through the city in English, Gikuy, Sheng and Swahili manifested in different class settings. – Brethren, Crazy Baldhead is about Crazy Baldhead. If the man have to explain him song he would’a write explanation, not song. I haven’t read much literature from New Zealand – I started reading The Bone People years ago but couldn’t finish it. Maybe I’ll go back to it. What little I know of New Zealand is from popular culture. I watched Once Were Warriors and Whale Rider years ago. I went to a rugby school here in Nairobi and lived in South Africa for eight years, between 1997-2004. Maybe because of this and any many other different reasons I am an All Blacks fan. I follow them quite closely. I watched them get beaten by Ireland on Saturday. I read New Zealand press at least every week – the New Zealand Herald and Stuff.co.nz on all things NZ Rugby. I am sure you will find this very funny. I studied Journalism at a University called Rhodes. I went back to teach at the Creative Writing MA programme for two months between July and August last year. The universities are on fire. Like rugby there are all these spaces that are still fighting for transformation. This has to be done in the long-term. For rugby the problem is that all parties have not sat down to talk through the transformation. At times this is not something that can be talked through. So it is what it is. 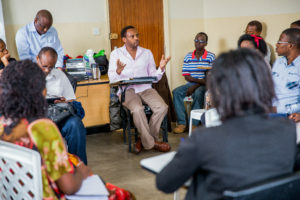 Billy teaching a writing class. Well, watching the All Blacks is kind of funny because it means you are familiar with our most popular poem, the haka ‘Ka Mate’ which literally talks about the nature of life and death in the Māori language. I love that poem. This is an article I wrote about it during one of the Rugby World Cup championships that we lost (a long time ago now). I can understand your comments about Ngugi’s ideas, given your language context (four!). Here in New Zealand we’ve been facing the threat of Māori language extinction since the 1970s. Basically, young people stopped speaking Māori in the cities. I can speak Māori passably, and have written a little bit in the language with the help of a friend who was born into it. Most of my extended family doesn’t speak Māori, just some of my younger cousins who went to immersion pre-schools and secondary schools. I learnt it at university. Writing in the language for us would mean a loss of audience, and yet there is a growing number of writers who are doing that, including the spoken word poet Te Kahu Rolleston, and the novelist and playwright Whiti Hereaka. Some of our popular writers, like Witi Ihimaera who wrote The Whale Rider, have also had their work translated into Māori. 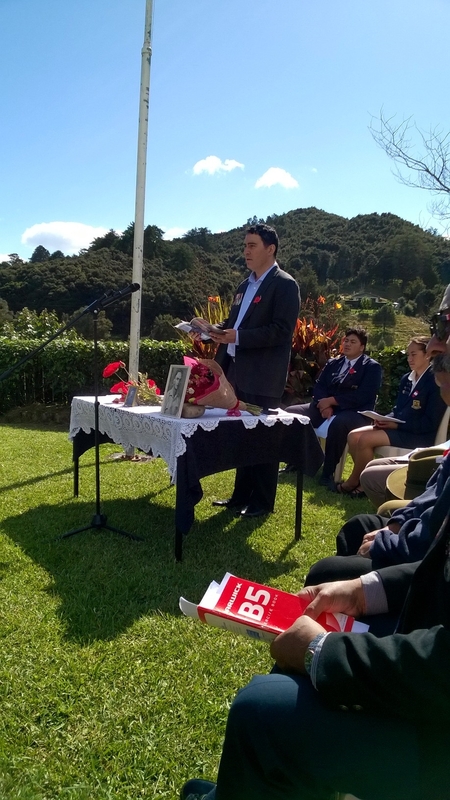 There is a wealth of material published for the Ministry of Education to use in schools (such as Whiti Hereaka and Peti Nohotima’s work), but none of this material is available for sale outside of schools. Hearing you talk about Kwani reminds me of our Māori writers’ organization, Te Hā, which is a committee of our national writers and artists’ organization, Toi Māori Aotearoa. We’ve been running since 1991, although our founding members were also part of a collective that began in about 1970. 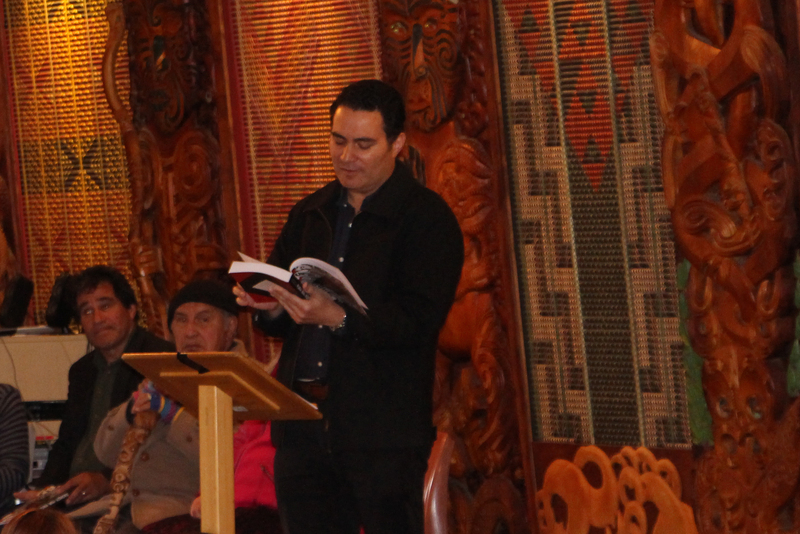 We don’t have a journal, although our principal founder, Witi Ihimaera, brought out a five-volume anthology of Māori writing across all genres in both languages. We run writing workshops at our annual gatherings, and have performances during the Matariki Festival in June/July, which is the traditional Māori New Year celebration. I put my second book, Piki ake!, online because it’s one of my most family-centred ones with a sequence about a reunion at my mother’s home village. I think I wrote it partly as a record since so many of my family don’t go back to Karetu. The collection is in English because that’s my first language, and as I said, most of the family only speak English. As I’ve learnt to speak Māori, I’ve learnt that there’s so much information only available in that language, and most of that information is the stuff of creative writing, emotion, spirit, relationship. Here’s a short video featuring the history of my tribe, Ngāti Manu told by one of my relations, Evelyn Tobin, subtitled in English. Whaea Evelyn recounts a piece of our history in the late contact-period, early 1830s, when we had traded with European sailing ships at Russell in the Bay of Islands. I’m drawn to this story because it resulted in the first removal of my mother’s people to a different headland in the Bay of Islands in the north of our country where we established another trading post. Ten years after that, it was the British who removed us by bombing the trading post with a frigate, HMS North Star. For us, this history is quite recent. It is the reason we come from Karetu, and not from Otuihu, or before that, from Kororareka/Russell. Of course these relocations were not like moving house! 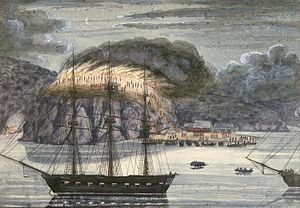 HMS North Star destroying the Pā of Pōmare II, 1845. Painting by John Williams. I didn’t know that the ‘Ka Mate’ was a poem. That’s wonderful. And also that the New Zealand anthem is also based on another poem. Our own anthem is based on a Pokomo lullaby (Pokomo are an ethnic group based at the Coast of Kenya). I travelled in their lands years ago doing research on Kenya’s biggest river the Tana which passes through their ancestral lands and there’s still a lot of unhappiness about the use of the lullaby without proper attribution. Very political stuff. I’ve even written a short story – ‘We Are Here Because We Are Here’, part of my upcoming collection – about my experience in the Tana Delta and with the Pokomo. Once published I’d like to send you the collection. 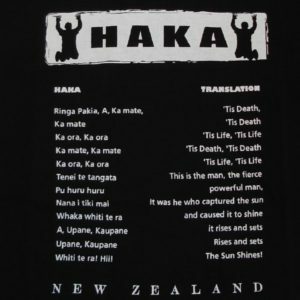 Is what you’ve written about ‘Ka Mate’ well known in New Zealand? In Kenya we hardly have anything akin to a ‘national poem’; there used to be pretty well-known traditional narratives that had national reach through media and the education system but now that seems to be a thing with the past. Increasingly, social media, memes now push legends, phrases that go ‘national’ but I can’t quite think of anything that combines the traditional and the popular. Correct me if I’m wrong but it sounds to me like what ‘Ka Mate’ is like in New Zealand. Maybe I am projecting my own fascination with the haka which is such an international phenomenon and not necessarily for the right reasons. Since we spoke I’ve actually written a piece for Chimurenga Chronic, a well-known South African based cultural network. The piece looks into the connections between creative writing training history on the continent and its influence on the craft of well-known writers. Using Ngugi as representative of an older generation of writers in East Africa, I look into how his time at Makerere University, missionary school, and the Old Testament have influenced his work. The Editors at the Chronic cut quite a lot of it that got into his politics of language and how that is related to his ‘influences’, training, etc. I’ve been thinking about that quite a lot beyond our ongoing conversation. What you say about the dearth of audiences in trying to write in Maori and any other non-European language has huge parallels in Kenya, as you’d imagine. And it is also true here about the growing number of writers trying to write in other languages which reflects the very real non-pragmatic necessity for writers in spaces like ours to tap into other aspects of language they are privy to outside of European languages. In my own recent writing more and more I find myself translating in my head. I guess this is what a growing number of writers are possibly trying to counter by touching base with their ‘father’ and ‘mother’ tongues. Please see a link here to the history of Kwani. Interestingly, like Toi Māori Aotearoa, we are really trying to do more writing workshops. In fact we are thinking of developing our own creative writing programme. I find the historical connections you’ve made in your own writing quite fascinating. I think I’d mentioned before that I’ve been working on a novel for three years. One of the major hurdles with it has been trying to reconstruct the working life of a teenage boy during colonial times in Kenya who is of the same generation with my father. I’ve had to reconstruct a period when he is part of a road-building crew twenty years before independence by reading political histories and looking for non-political asides to the narratives. Most of the official history of Kenya before our Independence is very political. What is also common is a lot of oral narrative of traditional life. Personal accounts are primarily English through letters and diaries. So, I had to do a lot of my own research on road building during colonial times in Kenya. I also spoke to my Dad quite extensively. Eventually, I did not use the reams of material I collated – the thing about research for a creative project is that it builds confidence and frees up the imagination. So after working for about six months and reading so many documents I did not use any of the material directly. So, thanks for the link to your book – I am always curious how writers use history. I’m writing this just a couple of days before our national commemoration of the major wars we fought overseas, called ANZAC Day. The commemoration has really become more popular in the last decade possibly because so many of the returned soldiers are passing away. I wrote a book about my grandfather who served at the end of WW2 in Italy. Two of his older brothers were killed in North Africa, in Egypt (El Alamein) and Tunisia (Takrouna). It’s ironic that we had both welcomed and fought the British in the 19th century during our Land Wars. I’d written the book, Cassino, City of Martyrs, to point out that our relationship with the British was actually a deep one, and to point at collective memory lapses. I also wrote it because my grandfather never spoke about the war, and I needed to know. I think he suffered from PTSD after he returned, and I think a lot of our men suffered quietly. Just a year ago our government agreed to mark the anniversary of our Land Wars and so for the first time it’ll be on October 28th this year. Most of the stories of the 19th century conflicts haven’t been taught in schools or talked about widely so many people just don’t know about them, and so they don’t know about colonization in this country. There has been some great work in starting a reparations and reconciliation process, though I worry that the reconciliation hasn’t been widely shared and so many people just won’t understand the depth of feelings, and the need for aroha or deep affection given the suffering that happened here not too long ago. The Waitangi Tribunal has a powerful set of reports from all over the country which tell the people’s stories about the loss of land, lives, and livelihoods here. Let’s hope the commemoration helps with the healing process. Some of my family contributed to the report on the War Veterans and included a poem I wrote for our two great uncles who were killed. I see it as part of a poet’s role to comment and incite, and to care about the currency, hopes and memories of one’s community, as well as to create something that was not there before the act of writing. 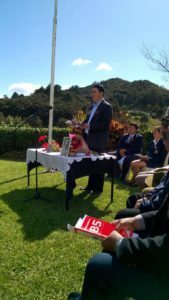 Robert reading from Cassino, City of Martyrs at Karetu on Anzac Day, 2016. Thanks so much for your context on how you’ve tried to connect the past and the present in your writing and enlightening me on ANZAC which I’ve seen in ceremonies before NZ-Aussie Test matches. I am quite jealous that you have the resources with which to write about historical events from 200 years ago. I find that as a contemporary Kenyan writer, I am limited to how far back I can go which is nor far beyond Kenya’s independence in 1963. And Kenyan writers have done a handy job of writing fiction that tackles the arrival of the British and immediate post-independence thought there’s still a lot to be done. A good writer friend of mine, Yvonne Adhiambo Owuor, wrote a great novel, Dust, a few years ago which I would call an alternative history of modern Kenya. Basically, Dust is a history of Kenya through the lens of its political assassinations. Political history since Independence is just so omnipresent and oppressive that it almost freezes the imagination. I’ve been trying over last few years to free myself of this especially as it’s drummed into one in school, and to invest more in personal subversive narratives as I’ve outlined I’ve been trying to do with the book I am writing. A few years ago I spent the better part of a year reading up on that and trying to write short stories based on Mau Mau times. I’ve also been thinking of doing a Creative Writing PhD to work on a novel loosely based on Kenya’s recent Constitutional process in the early 2000s. So, unlike New Zealand where it seems that there is a lot of creative writing spanning ‘history’, there are still large gaps beyond the Ngugi generation and its fascination with post-independence Kenya and latter colonial period especially with Kenya’s recent political history in the 90s. So, unlike the context you give, in Kenya here we do have a lot of colonial history and awareness about it in general but very little before that and the recent past. I’m writing from Haworth in Yorkshire, not far from the Bronte Parsonage, where my partner, Rachel Fenton, is researching a graphic biography of one of Emily and Charlotte Bronte’s friends, Mary Taylor, who lived in New Zealand for a time in the late 1840s to mid 1850s. I’ve only read two Bronte novels, Jane Eyre and Wuthering Heights. I might have seen a TV movie of Wuthering Heights and I used to be a Kate Bush fan. Plus I read Jean Rhys’s The Wide Sargasso Sea, so I’m more familiar with things associated with the novels. Isn’t that how it works in literature anyway? It makes you wonder about the after-life, being in Haworth. When I stop this message I’ll visit the Bronte graves inside the little church here, and then the parsonage. How is it that some literary work endures in the real world, so that real people become pilgrims to the stories? When I taught creative writing, for me it was about emotion. I based it on Ezra Pound’s definition of the image, and his emphasis on newness which meant one needed to know what was traditional. Only emotion endures. You can see places like Haworth elsewhere. Florence has a three-story house decked out in part as if it was Dante’s home. Yet Haworth it’s a little more obvious because the town is so much smaller in its range than Florence, although I’m only a tourist cruising through so there may be much, much more to this place. 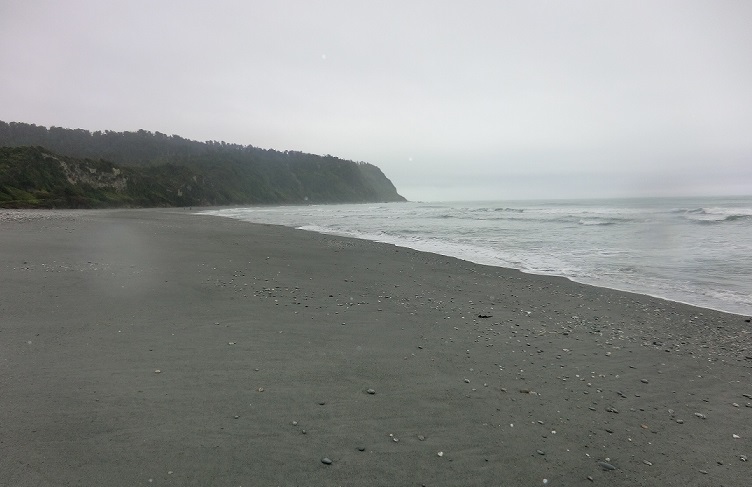 I have some places I’d love to visit that have associations with writers dear to my writing, such as Keri Hulme’s Okarito on the southern West Coast of the South Island, or Kaka Point where Hone Tuwhare spent his last days writing his nature poetry. In fact, it’s a feature of Māori poetry in English that we reference our natural environment, yet it sounds silly to put that in plain language like this, too non-poetic if you know what I mean, too blimmin obvious. Hulme, for instance, has the shore line of Moeraki communicating through the waves striking the sentinel rocks there, she has the flax and the midges speaking, whales singing off the coast. The closest I’ve come to it in non-Māori literature is in a couple of German language poets, Rilke and Holderlin. It’s as if Hulme has access to her subconscious and communicates at the level of the collective psyche. Māori words have a special resonance for her, and even more effectively, the Māori words are in local Ngāi Tahu Māori dialect so that the language derives from the people of the coastline. I’ll be seeing some of the moors and the Yorkshire dales soon. There’s so much scale here in how the land rolls up from the heights so that you feel the wideness of the sky. There’s a curvature here, that kind of scale. Okarito Beach, South Island, New Zealand. I really like novels that capture place. I’m quite a fan of Virginia Woolf and I visited her home in and I’ve been reading her diaries. I also visited Jane Austen’s house years ago. Because I studied in South Africa I am quite familiar with the landscapes one of my favourite writers, J.M Coetzee especially in Disgrace and Life and Times of Michael K. My own novel-in-progress is based in Buru Buru, the estate I grew up in, and I have spent quite a long time thinking about the physical nature of the estate and its link to my psyche and that of the main characters in the book. Here is a link to an essay I wrote recently about growing up there. 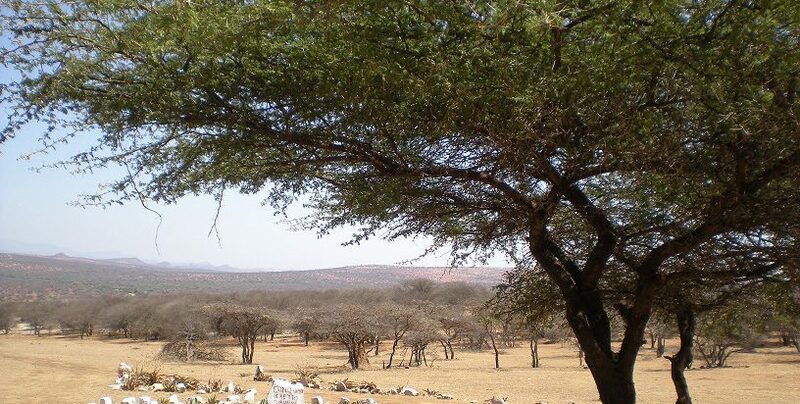 Part of the novel is also based where my parents come from two hours away from Nairobi in the country and I write a lot about a mountain range called the Aberdares … I try and reflect on the physical landscape, particularly the Aberdares, and what it does to the psyche of one of the main characters. I think that the European modernists really thought a lot of about the relationships between ‘in-scapes’ and physical landscapes. I recently read Thomas Mann’s The Magic Mountain and that has really influenced my own thinking about this book I am working on. I’d really like to read Keri Hulme. Thanks for sending the link to your essay about Buru Buru. I can see the reason behind Mrs K in your novel. I really sense the intergenerational, family dynamic of the place since you move between now and the 90s so comprehensively. Economics unfortunately plays such a large part in communities, and cracks in an individual such as Mrs K who sounds like she was a leader in the community must provide powerful fuel for a novelist. I can’t wait to read your novel. 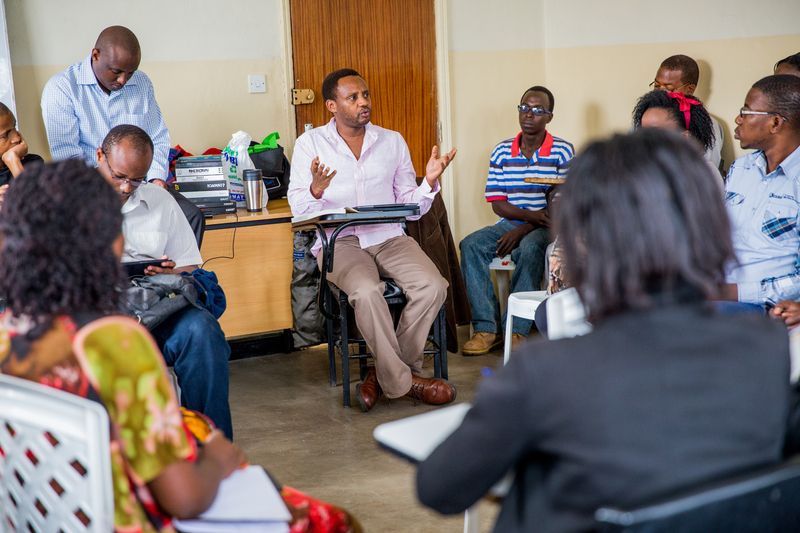 Also, congratulations about the great work you’re doing with the Kwani writers’ collective. All power to you. As for the haka, ‘Ka Mate’, it’s very well known in New Zealand. Most New Zealanders can give you a rendition, although it isn’t always with the best pronunciation or recall of the actions. I just love the poem’s politics, its refusal to accept death, and its embrace of the rising and setting sun. I’ve noticed that your writing, at least the excerpts I have read, have a very distinct voice and just wanted to get a sense of how you approach narrative voice. Is this something you consciously do. How do you choose your narrator? I’ve been thinking about this question of voice for quite a while. I ask because for me the question of place comes from this. For the book I’m writing I struggled to find the right tone, the right register for the novel. The main character/narrator, Mrs Faith Karoki, decides to go mad to ‘escape’ her husband and family and their middle-class setting. I set out right at the start to write a novel told completely told in different subjective voices by Mrs Karoki and the rest of her family. In Mrs Karoki I wanted to write a book that not only recreated her ‘mad’ voice and the reactions of her children and her husband but also capture different languages, registers from all of the characters that illustrated the socio-political and socio-economic dynamics of Kenya at the time the book is set, 1990s Kenya. Part of the struggle was recreating a language in the novel had evolved in the informal social and political spaces in Kenya within the context of the English I had been taught formally. But by and by I started hearing her in my head and once I could do that I felt that I knew her concerns and I could see her immediate setting and the world she lived in. For me more than anything this was about time. Another main character, Mr Karoki, identifies with the mountain but its immovability holds a fear for him. Because he is an engineer of roads, he also sees it as an enemy of progress. So, for me place not only creates the world in which characters live but also provide contexts which can illustrate character’s strivings, and of course place can always be a metaphor in a larger sense. Most of my writing is grounded in poetry and place, and as you suggest, place is often metaphor. I’ve heard it said that the setting for a work of fiction can be a character, can voice itself as struggle, or a range of other literary limits in the fictional world. In my poetry I like to think the ‘I’ is a collective pronoun since I believe in a family of spirits who accompany me. This sounds to an extent like the familiarity you have with Buru Buru. Witi Ihimaera is known as the chronicler of Waituhi, since his home village flavours his many stories and novels with voices from there. In my extended sequences, such as Captain Cook in the Underworld and Star Waka I quite consciously adopted multiple personae, yet these are limited by my own understanding of such major things as class and gender which I’m happy to own. It gives me more to look forward to in future writing projects. I am most familiar with place, and tend to orient my work by referencing my mother’s village, Karetu, which has ancestral and historical (derived from civics and the political engagement there) resonances. I’m quite interested in the madness of your character Mrs Faith Karoki. Albert Wendt, the great Samoan novelist, who has been influenced by a number of postcolonial writers, uses a similar device for the central character in his wonderfully intense short novel Pouliuli. I highly recommend it. Wendt also passionately writes about mountains. I am only sorry that our conversation is coming to an end. I will look through the other emails you have sent in order to catch more of the generous threads and the passion that you have shared with me, Billy, and others here in Aotearoa. Ngā mihi nui ki a koe, big greetings! 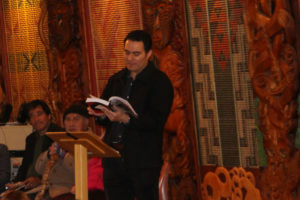 Robert reading at the University of Auckland marae during the book launch of Puna Wai Kōrero, an anthology of Māori poetry in English which he co-edited with Reina Whaitiri.